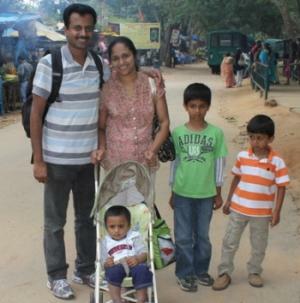 We visited the Bannerghatta National Park and zoo yesterday. We chose the Friday to visit this place since the week ends are usually very crowded. Also, the school was closed for kids yesterday. Since I am quitting my job and doing business from home, I could choose any day for outing! There is a public bus stand just in the entrance of the Bannerghatta National Park. There were many buses from the city coming and going, which make it easy for people to visit the place even if they don't have a car. After parking, we walked towards the park. The ticket counter is located at the entrance of the park. We purchased the tickets and walked into the park and waited in the queue for the Safari. One bus just left the place before we could walk-in. It took about 30 minutes waiting to get in to the next Safari. It was one of a kind experience for our family. We saw several animals including lions, tigers, bears, different types of deers, elephants, bisons and white tigers very close to the bus. The bears were blocking the road and our driver had a tough time getting through the jungle without hurting them. The lions walked away when the bus approached them, but the tigers did not look very friendly when kids laughed and screamed at them! The tour guide was asking all kids to be silent when the tiger was close to the bus. Overall, it was a great safari. We all enjoyed the Bannerghatta National Park visit. It was really worth the time and money for all of us. Kids really enjoyed watching the animals so close. I don't think there is any specific season to visit this place. Since seasons are not very prominent in India, any time of the year would be fine. My only suggestion is to avoid week-ends and holidays since the park will be very crowded during those days. This price include Zoo admission. There is 50% discount for school students. So you are travelling with school carry their school id cards. You won't get the discounts without the school id cards. There is some discount for senior citizens. If you are travelling with old parents, carry some age proof to avail this discount. There is an Rs 10 parking fees. Entry to Butterfly park requires separate admission ticket. Here are some tips if you are planning to visit this place. Visit early hours. If you can reach before 10am, there won't be much crowd. If you arrive late, be prepared to spend hours in the queue for the Safari. Choose a week-day if you can. Week-ends and holidays are really busy and crowded at the park. If you have school going children, carry their Id cards. The park offers 50% discount to school students but you need to show the Id cards to avail the discount. Safari is the biggest attraction. Be prepared to spend Rs 160 for adult and Rs 85 for children for Safari. This price include Zoo admission. Do not throw away your Safari tickets. The same ticket is needed to enter the zoo at the end. Go for the Safari first when there is less queue. During busy period, you may need to spend up to 4 hours in the queue for the Safari. Safari takes an hour or a little bit more to complete. Use toilets for the kids before the safari, if needed. They won't be able to stop anywhere in the jungle for kids. Tip the tour guide and driver in the van and he will shoot lot of good pictures with your camera. Rs 100 sounds reasonable to get good pictures! The tour guide may even give away his front seat to you! Bannerghatta National Park and Zoo in Karnataka state is a plastic-free zone. Do not buy many eatables before you get in to the safari or zoo. Inside the zoo, they will make you throw away all plastic carry bags/bottles or transfer your food into dirty paper bags provided by them. They never opened our shoulder bags and hand bags (which means you can hide food in proper containers inside your bag). They seem to be worried about the throw-away plastic bags and bottles only. The zoo is probably a good place to sit and relax but not so great to watch animals. There are very few animals there! 1 hour is enough to see the full zoo. There is a nice park for children inside the zoo. Plan for an hour or more there and kids would love it. There is only 1 restaurant near the zoo area. If you are concerned about hygiene and healthy food, you may want to plan for food somewhere else. There are few small restaurants on the way to the zoo. Other than that, you won't see any eating places once you enter the NICE road from Bangalore city. This is my first real photography experience with my new Cannon Rebel T2 camera. I am still learning how to use this new toy, but I think I clicked some great photos. My only regret is, I missed an amazing shot of a roaring bear approaching the bus but the driver grabbed the camera to shoot it and missed the picture while he trying to figure out where to click. Described very nicely, We also could travel & had a share of your experience. Thank you very much lot of information. Good review. Your photo skills are also good. Thank you for the detailed information about Bannerghatta. Can you please give the details about the safari timings and entry fees? Many blogs are showing different rates and I am not sure what is the latest fees. Nitin, thank you for your comments about the latest admission ticket rates in Bannerghatta zoo and safari. Thank u so much ur details about the Bannerghatta national park and zoo. Amazing pictures helped me with my project. Nice review sir helps a lot in visiting Bannerghatta national park and zoo.